Today, we’re excited to announce that our integration with BigQuery, Google’s low-maintenance cloud data warehouse, is out of beta! This makes BigQuery the latest addition to Segment Warehouses, the easiest way to analyze your customer data in SQL. 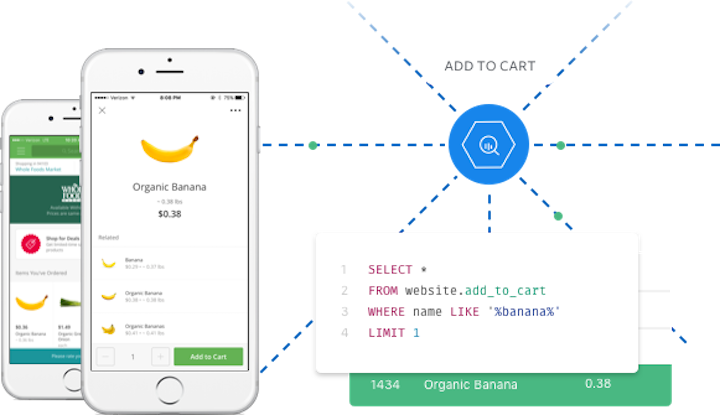 With Segment and BigQuery, you don’t have to build out your own ETL process to stream data from your mobile apps, websites, and second-party data sources like Zendesk and Salesforce into a data warehouse. Segment Warehouses schematizes and loads this data for you out of the box. Since we launched our Warehouses product, we’ve seen a voracious excitement in the analytics and product management community for leveling up their analytics stack to SQL. Out-of-the box tools are great for quick analyses, but when you want to dive deep and understand very granular user flows, you’re going to need the power and flexibility of a SQL database paired with a BI tool. Now, with BigQuery and Segment, you can pipe petabytes of raw data from your website, app, servers, and cloud sources like Salesforce and Zendesk into a fully managed, auto-scaling cloud data warehouse. Choosing Google BigQuery as your cloud data warehouse will empower you to quickly query large data sets and scale seamlessly as you grow, without the need for ongoing maintenance. Tasks like adjusting your cluster size, adding more machines, and vacuuming tables for optimal query performance often requires time and resources that you don’t have. With BigQuery, there’s nothing to tweak or tune—it just works. With traditional on-premise databases, data is stored on physical servers that you maintain. The more your data grows, the more hardware you need for storage, and that can make scaling your analytics cost-prohibitive, not to mention costly for hiring. Since BigQuery offers a serverless cloud solution, one of the key advantages that it offers over traditional on-premise databases is limitless storage and affordable scalability. If you’re already using a cloud data warehouse solution, you might be wondering what makes BigQuery different from others out there, especially now that Segment is making it so easy to load data into your warehouse of choice. It’s cost-efficient to store data — BigQuery has very low storage costs, and you can manage data querying costs easily through Google’s cost controls and query caching. Additionally, now with flat-rate pricing for high volume or enterprise customers, Google’s made it even simpler to plan for your usage costs than ever before. It adheres to standard SQL — In the past, many analysts complained about BigQuery’s SQL-like language. Now, BigQuery uses a revamped SQL dialect that’s compliant with the SQL 2011 standard, so more and more of your team can get started with BigQuery right away. Set up a BigQuery account here. Connect your BigQuery account to Segment. Connect cloud sources your company uses like Zendesk, Salesforce, and SendGrid to Segment. Track user events with Segment’s data collection libraries. See your data flow into BigQuery and query away! To incentivize more people to check it out, Google has graciously offered Segment customers a $300 credit on BigQuery. You can start your 60 day free trial of BigQuery here.